An agreement between Samsung and Mediatek was reached last month, in which the outcome was that mediatek will start supplying and making of processors for samsung devices. 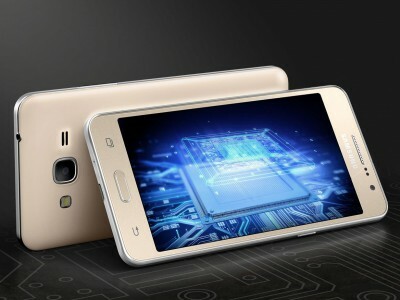 The samsung galaxy prime plus may become the first samsung phone with mediatek Cpu, the Antutu based benchmark data has confirmed the model number to be SM-G532F. 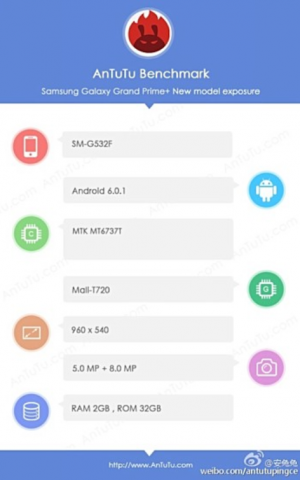 It will be equipped with a MT6737T chipset and Mali-T720 Gpu. According to AnTuTu specifications, the Samsung Grand Prime + will have a 5-inch display with a screen resolution of 960 X 540 pixels, 2GB Ram, 32 GB of internal memory, 8MP main camera and 5MP front camera. It will have the Android 6.0 Marshmallow Os upon it final release. The lunch date of this device and price is currently Unknown. But Will be available soon.